Moving to Cambodia and traveling halfway across the world with my cat, Lionel, was certainly not a decision I took lightly. 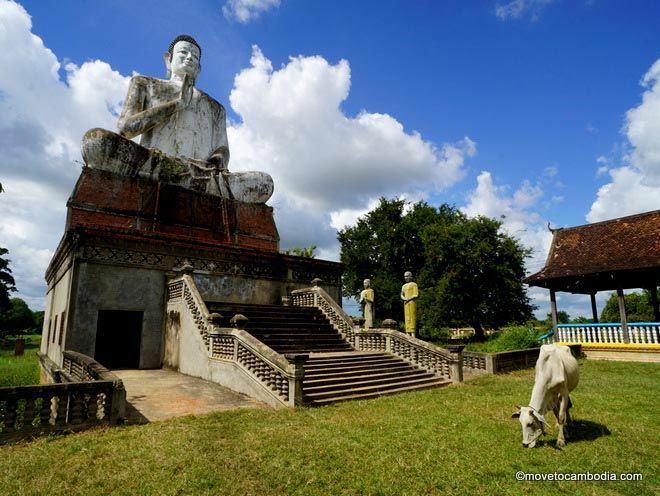 There were a lot of factors to consider when deciding to travel with my pet from the UK to Cambodia, such as: the stress of the journey for him, the heat in Cambodia, and the standard of pet healthcare in a developing country. However, one very important factor overruled them all — love. So when I moved from the UK to Siem Reap, I simply couldn’t leave Lionel behind! As there aren’t any direct flights from the UK to Siem Reap, it wasn’t easy to find an airline to transport Lionel the whole way. One of the most popular options is to fly to Bangkok and then bring your pet overland, but I really didn’t want to bring him over the border myself. So after a lot of research, the best option I found (factoring in cost, traveling time, and convenience), was Vietnam Airlines, flying from London to Siem Reap via HCMC. However, I later found some other options that may have been faster, which are listed at the end of this post. All I had to do was contact Vietnam Airlines via email or phone after I had booked my ticket. They were very responsive to emails, and asked for the details of my flights (main flight and connecting flight) and the VN reference or ticket numbers so they could book Lionel on the flights. This had to be done at least 24 hours before the flight’s estimated time of departure. Ask for confirmation to be sent to you via email and print it off just in case there’s a problem at the airport. A very important thing to be aware of here is that there are two separate flights coming from the UK — I just assumed the connecting flight from Ho Chi Minh City to Siem Reap was with Vietnam Airlines because it had a VN flight number, but it was actually a code-share with Cambodia Angkor Air, who do not transport pets. I had to change my connecting flight to a later one with Vietnam Airlines, which wasn’t too much of a problem, but it would have been better to know this at time of booking because there ended up being a much longer layover than I originally expected. There’s nothing quite like learning by the trusted method of ‘finding out the hard way’! It was my responsibility to make sure all the traveling requirements were met and that everything was in order when I arrived at the airport. These were the airline’s requirements; there were no specific requirements on the Cambodian side to bring my pet into the country. Once he was on the plane, nothing else was required, neither in transit nor at Siem Reap airport. To satisfy Vietnam Airlines’ requirements, Lionel had to be micro-chipped and have a rabies shot at least 30 days before the travel date. He needed a health certificate from the vet which had to be issued within 10 days of the travel date (I got this two days before the flight, just to be on the safe side). Lastly, he needs a pet passport from the vet to document all of this information. In addition, the pet carrier must be IATA approved. This means it must have solid edges (hard plastic) and one side must have a metal door. Also, there must be a pet pad or blanket on the floor and enough room for your pet to stand up, turn around and lie down. An IATA approved pet carrier. Checking in was surprisingly easy. When I arrived at London Heathrow, I simply had to take Lionel to the customer service desk at the check-in area in Zone G — this is the same place you check-in your own luggage because pets are carried as checked baggage and not as cargo. Once they confirmed that all the paperwork was in order and I paid the required costs, he was good to go. Someone from the baggage department came and took him away — I did my best not to cry, but failed miserably! Tip: Check the label on his box to make sure it says Siem Reap (REP). Try put some ice in his water box so it will slowly melt and make sure he has some biscuits for the long journey ahead! I honestly didn’t know what to expect when I arrived in Siem Reap, so I crossed my fingers and hoped for the best. To my surprise, when I got to the luggage reclaim area, his box was sat next to the luggage carousel, and luckily, he was in it! No one checked that he was my cat and no one asked for any paperwork or payment — I simply picked him up and walked out the airport (unfortunately, anyone else could have done this too). After a few days of food bribery and an abundance of cuddles, I was forgiven. Lionel chilling in his new Cambodian home. Although I ended up going with Vietnam Airlines, once I found out that I couldn’t transfer to Cambodia Angkor Air the flight became a lot longer than expected, and it turns out that other airlines would have gotten me from the UK to Siem Reap in less time. There are no direct flights between the UK and Cambodia, so all airlines will require at least one flight transfer. 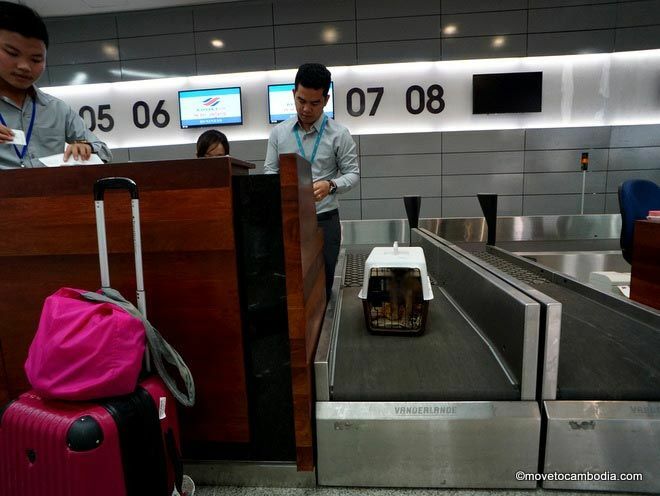 China Eastern has flights from London to Siem Reap via Shanghai, with a relatively short layover, and they allow pets to travel checked as baggage. Singapore Airlines accepts some breeds of cats and dogs on their flights from the UK to Siem Reap via Singapore, but have a long list of requirements and documents needed. They only allow pets to travel as checked baggage. Thai Airways also allows pets to travel checked as baggage, plus they will accept pets traveling as manifest cargo via Bangkok (ie. you don’t need to be on the plane as a passenger, so you can have your pet sent after you are settled in Cambodia). Asiana also fly between London and Siem Reap with a stopover in Seoul. They are one of the few airlines that allow pets in the cabin if they weigh less than 5 kg (11 lbs) and can fit under the seat, but their one-way flights are prohibitively expensive. For all airlines, it is recommended that you let the pilot know that your pet is traveling so they keep the temperature in the luggage hold at a more pleasant level. 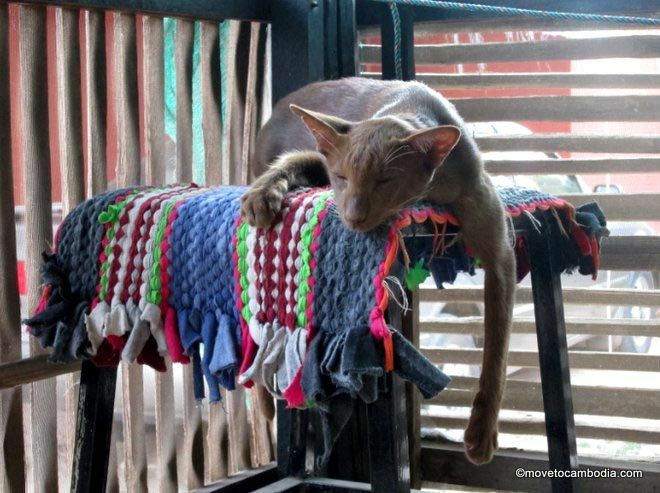 This entry was posted in Expat Life, Transportation and tagged Vietnam Airlines, pets in Cambodia, importing and exporting pets. Bookmark the permalink. I am sure you get asked this a lot but do you know if an import permit is required for entering Phnom Penh with a pet carried as accompanied baggage (not manifest cargo?). My cat will be flying in on Qatar Airways and will have a vet health certificate and up to date vaccinations including rabies. I’d be grateful if you could help as I have a pet relocation agent trying to charge me hundreds of dollars for this but I am not sure it actually exists? Hi Clare. That’s honestly why I didn’t go with a relocation agent – being charged an arm and a leg for things I didn’t need! It may be the case that for some countries you need an import permit, but you don’t need one for Cambodia. My cat travelled with the baggage (not cargo) and when I arrived in Siem Reap he was just waiting next to the luggage carousel for me to collect – I just picked him up and walked out. No questions, no paperwork, no fees, nothing. It really was that simple when I arrived. The only requirements were those of the Airline itself for him to travel (health certificate, vaccinations etc). I hope that helps! I hope you are still reading this post. I want to travel with my dog and cat from Romania with Qatar airways to Phnom Penh. Did you need additional paperwork for countries you transited? Hope you all arrived well in Phnom Penh. 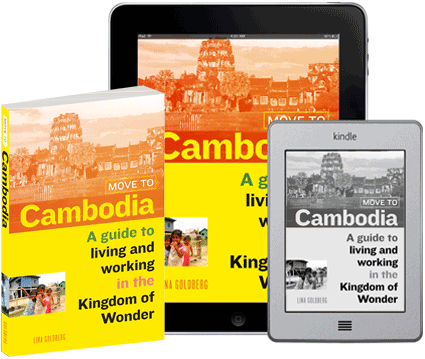 Hi Susan, you can check out the Expets Cambodia Facebook group, you’ll be able to get some answers there. Hi Lina, thanks for the reply I will have a look at Expets Cambodia. Welcome to Cambodia, Rebecca and Lionel! 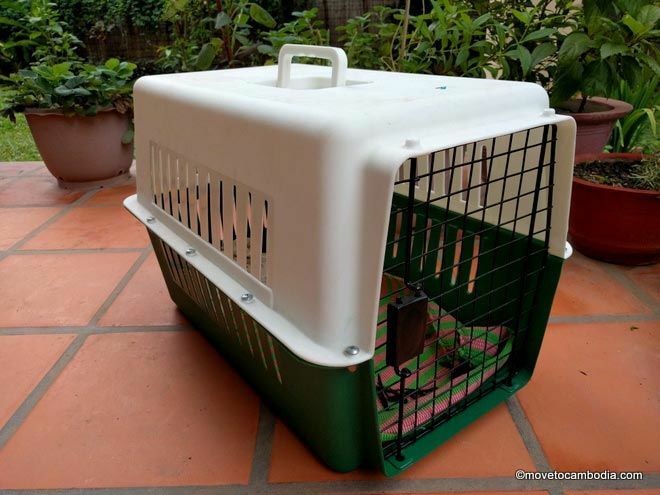 Rebecca, one small thing, when I was preparing to fly my cats to Cambodia, the airlines told me that I needed to reserve a spot for the cats so they could be sure I’d be on a flight with a *livestock hold* — there is no climate control in the cargo hold, or so they said. Animals travel in a separate part of the plane.